What are the different methods of low pressure calibration? Ensuring the accuracy of transducers used in the measurement of room pressure in critical environments is extremely important in order to maintain patient safety. Because the differences in measured pressure are so small (only fractions of an inch of water column) calibrating these devices can be very tedious and usually difficult to perform without the right tools and processes. In general, there are two industry standard methods of low pressure calibration: hand pump calibration and automated calibration. Open loop pressure generator subject to environmental disturbances, results can be affected by human contact and by changes in room temperature. Closed loop pressure generation technology immune to environmental factors. Can log, save, and verify results for regulatory compliance. In the video below, Dan Hall from Hall Associates details some of the challenges of low pressure calibration and how these different methods work in practice. When calibrating low differential pressure transducers, one of the most critical and often the most difficult thing to do is generate a stable and accurate low pressure as a reference. Setra’s MicroCal uses NASA patented pressure generation technology, enabling control stability below 0.0002”W.C. (or 0.000007 PSI). 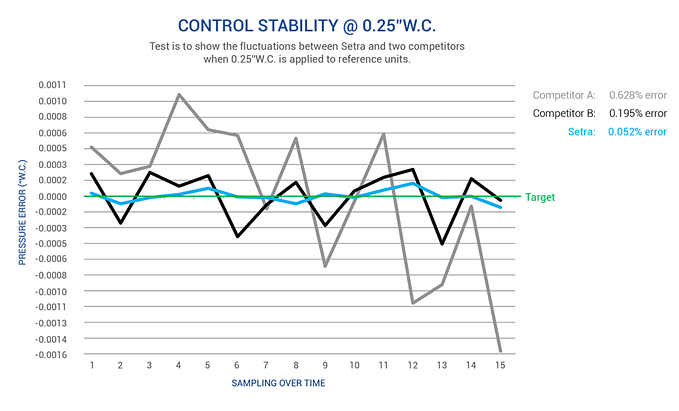 As the chart below illustrates, the pressure generation technology in the MicroCal even compared to other automated systems is superior, demonstrating only 0.052% error at 0.25” W.C.
SETRA BLOG: What are the difficulties of low pressure calibration? Unlike hand pump systems, most automated calibrators use a closed-loop pressure generator; air being tested within the system is isolated and is not affected by its environment. In open-loop pressure generators used by hand pump calibrators, results can be altered by changes in room temperature, changes in air pressure (by opening a nearby door or window), or from physical contact by the user. Automated calibrators tend to be compact, self-contained, and portable which means they can be brought on site to perform the calibration. 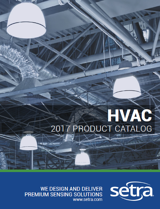 These features eliminate the need for pressure transducers to be uninstalled from their locations and transported elsewhere for calibration. A user can perform a calibration by themselves without causing significant downtime at the facility. The calibration process itself is also substantially shorter when using an automated calibration system. An automated calibrator can perform a 5 point calibration in just over a minute, whereas a single point using the hand pump method can take several minutes alone. These factors combined demonstrate the ROI operators can get by choosing an automated calibration system over a hand pump calibrator. Users can spend 80% less time performing calibrations and reducing a facility’s downtime significantly. 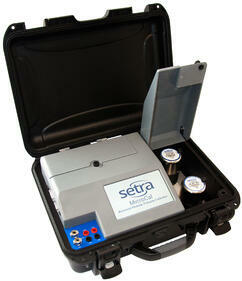 CLICK HERE to learn more about Setra’s automated low differential pressure calibrator, the MicroCal.